Anthony Cacace is looking ahead to an exciting 2015 as he seeks to take on the best in Britain, according to coach Shane McGuigan. 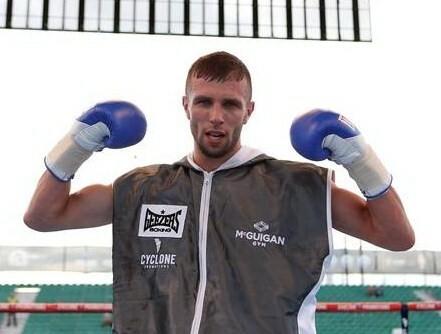 The Belfast super-featherweight has got his career back on track with two victories in three months, the second coming on Saturday night in Liverpool when he comprehensively outpointed Lithuanian Simas Volosinas over six rounds, 60-54. Cacace was never in any trouble as he dictated from the opening bell, though he felt a little frustrated at not being able to make it two stoppages in succession. The unbeaten prospect, who is highly regarded by Shane's dad and former world champion Barry, will aim to move up a class in his next fight as he bids to move into British and Commonwealth title contention. Coach McGuigan said: "It was a very good performance from Anto. He would have liked to have got the guy out of there but the guy was so negative and after he got caught with a great right hook to the body he went into his shell. "Anto has the ability to make many fights one-sided and it's the same with sparring sessions - we have good guys come in and because of his power and boxing ability he just dominates them. "I believe that he's ready for anyone in Britain right now, but he is still learning and the way I look at it, he's just had two wins with us and we have a lot to work on. "He has great potential and we'll keep him very busy in 2015 so he really pushes on. "When I look at the top British guys like Liam Walsh and Gary Sykes I have no doubt Anto can handle them. He is very big for the weight and punches really hard - people will start to get excited about him when they see what he can do."